Ram Charan to work with Express Raja Director Merlapati Gandhi. Home/NEWS/Ram Charan to work with Express Raja Director Merlapati Gandhi. Ram Charan to work with Express Raja Director Merlapati Gandhi, If the movie works at the box office.UV creations want to make a movie with Charan. Mega Power Star Ram Charan Tej who has been disturbed with the disastrous result of Bruce Lee is searching for a good script to work on next. Meanwhile, Venkatadri Express fame director Merlapati Gandhi approached Ram Charan and narrated a story. Listening to the story Ram Charan was very much impressed and kept him in hold. But why did he do so? 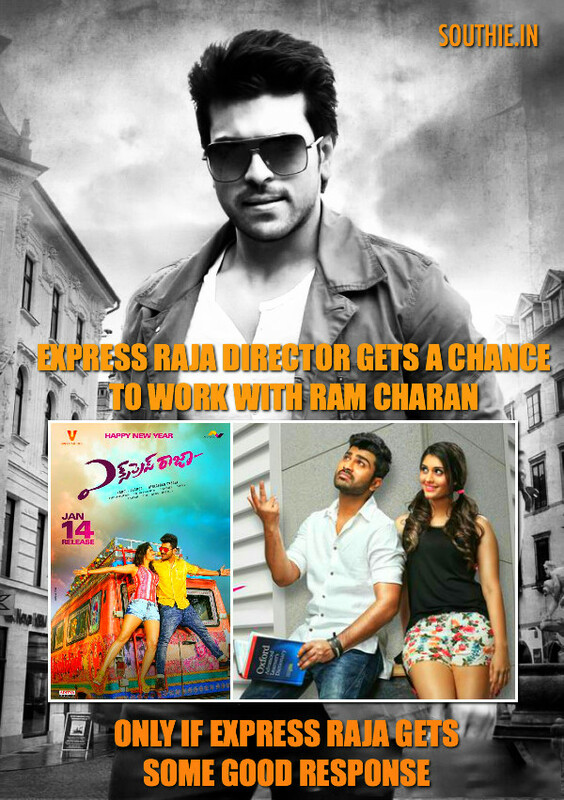 Well, it is because director’s second movie Express Raja is all set for release on January 14th so depending on the result of the movie Ram Charan might give a chance to the upcoming director. It is also said that if everything turns out to be good, then UV creations will be producing the movie with high budget. Let’s wait and see if Ram Charan gives nod to this man.